I had my first ultrasound at what I though was 6 weeks 2 days. However the u/s tech told me I was only 5 weeks. I'm not really worried about that considering it would make more sense in terms of possible conception dates. Anyways, the tech said, "Do you see what I see?" when he began the ultrasound and that's pretty much when I stopped paying attention since I did see that there were two sacs and my mind started racing. Anyways, I cannot remember what the sac on the right looked like during the ultrasound and if this was just a bad picture. I know sometimes, depending on the angle, not everything is caught but in the picture it looks like it is empty. Has anyone else had an experience with this? My next u/s is Friday and I will be 7 weeks. Hopefully we see two heartbeats! HI...ive read so many of the stories women are experiancing and i am troubled with mine. i went in yesterday for a scan and the doc picked up 2 sacs,she says one looked empty and the other seems to have something,however she cant find a heart beat. i am 8weeks pregnant. 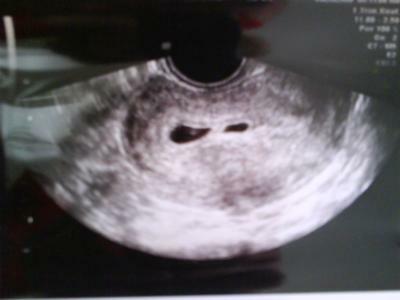 its conformed that it is twins and that i should wait 2weeks and go back. does this happen? doc says i should be carefull and just pray as anything can happen.but in cases of miscarriage with twins a dnc must be done. i feel very much pregnant with all the signs etc.and she says to look out for bleeding. should i worry? does any 1 have similar incidents? Any updates? So many posted on this thread but no one said what ended up happening.. I am in a same boat. At 6 weeks 5 days 2 sacs but only one heartbeat. They said they don't think it is a twin but to wait and see.. Please post an update to your stories ladies. Thanks! Ok so I'm going threw the same thing right now. Went almost a week and a half ago found out I was 5 weeks and 6 days with 2 sacks... the u/s tech didn't even tell me about the second sack but doctor told me that it was empty and it just didn't and wouldn't develop. I go in this Friday to have another u/s and see if the baby that did show up is doing better bc it's heart rate was only 110 and that concerned the doctors. Not going to lie my husband and I are hoping the second sack was just slow at development. Hope that I'm not just wishful thinking and I pray that everything with all babies are good. Don't rely on a test to tell you that your baby or babies aren't making it and have them "taken out" many times u/s techs are flat out wrong and even doctors can be wrong. If you have a miscarriage/spontaneous abortion as they call it you will have cramping and bleed a lot. I know. I went to the doctor at 5 weeks 4 day and two sacs were believed to be seen. Doctor said that baby is too small to be clearly seen in the ultrasound at this point and that 3 weeks more would be needed to confirm twins and see more. Be careful. We have the same story. Two sacs were seen on the ultrasound at 7 weeks but only one heartbeat was seen. The ultrasound technician never mentioned anything about twins but in the picture you can clearly see two different sacs and babies in them. The nurse also found two heart beats later at around 16 weeks with the doppler. My doctor wants me to wait for 20th week ultrasound (in 3 weeks) to find out. What ended up happening?! We are in the exact same boat, I thought I was 7 weeks though. First ultrasound 6wks. Thought I was 10! Two empty sacs. My blood work is getting done to see if my hormones are increasing or decreasing then I'm back to the table for another ultrasound. Please pray things go good for me!! I was told by my gp that I'm 8weeks and had a scan to make sure that the things r goin on well. At my scan they said u r 5 weeks n they saw two sacs, only one of them contained a yolk sac. I'm called for another scan so let's c what happens. They said might be the growth has stopped. my first ultrasound looked alot like yours except nothing appeared in either sac and i was six weeks. i'm sorry to say but i went back to the doctor at 9 weeks and realized that one twin had "vanished". i still feel that the other twin is "hiding". (wishful thinking)but i hope all goes well for u! hi! may i know what's your update on your 2nd ultrasound? we have almost the same case, i had my 1st ultrasound based on my last menstrual period i am 6w4d but based on the ultrasound age the baby's size is just less than 6 weeks, the tech saw 1 gestational sac, 2 yolk sacs, but only 1 has an embryo with a good cardiac activity. i have to go back for another scan after 2 weeks to chek if the other one continued to grow and have a heartbeat or it can vanish and not continue..
my daughter 1st sono looked very simalar to this. They told her it was a blood clot. I not sure I would agree. Hers was done at 7 weeks, 3 days. Has another tom. They did see the heartbeat. So cool. It does look empty, but it's so early on so they're teeny tiny! So, never know! Ultrasound pictures can be tricky anyhow! Hope you'll let us know what you find out Friday!